Nitai-pada-kamala, koti-candra-susitala, je chayay jagata juray. This is a song by Narottam das Thakur, a great acharya of the Gaudiya-vaisnava-sampradaya. He has written many songs about the Vaisnava philosophy, and they are approved as completely corresponding with Vedic instructions. So here Narottam das Thakur is singing that “The whole world is suffering under the blazing fire of material existence. Therefore, if one takes the shelter of the lotus feet of Lord Nityananda…,” whose birthday is today, 31st, January, 1969. So we should relish this instruction of Narottam das Thakur that in order to get relief from the pangs of blazing fire of this material existence, one should take shelter of the lotus feet of Lord Nityananda because it is as cooling as the moon rays combined together of millions of moons. That means one will immediately find peaceful atmosphere. Just like a man works whole day and if he comes under the moonshine he feels relief. He says that “If you are anxious to go back to home, back to Godhead, and become associate of Radha and Krishna, then the best policy is to take shelter of Nityananda.” Then he says, se sambandha nahi ja’r, brtha janma gelo ta’r: “One who has not been able to contact Nityananda, then one should think of himself that he has simply spoiled his valuable life.” Brtha janma gelo, brtha means for nothing, and janma means life. Gelo ta’r, spoiled. Because he has not made connection with Nityananda. The Nityananda, very name, suggests… Nitya means eternal. Ananda means pleasure. Material pleasure is not eternal. That is the distinction. Therefore those who are intelligent, they are not interested with this flickering pleasure of material world. Every one of us, as living entity, we are searching after pleasure. But the pleasure which we are seeking, that is flickering, temporary. That is not pleasure. Real pleasure is nityananda, eternal pleasure. So anyone who has no contact with Nityananda, it is to be understood that his life is spoiled. “Please catch up the lotus feet of Nityananda.” Then he says, nitaiyer carana satya. One may think that as we catch hold of so many shelter, but in this material world later on they prove false, similarly, suppose we catch hold of the lotus feet of Nityananda; it may also prove false. But Narottam das Thakur assures that nitaiyer carana satya: “It is not false. Because Nityananda is eternal, His lotus feet is also eternal.” Tanhara sevaka nitya. And anyone who takes to the service of Nityananda, they also become eternal. Without being eternal, nobody can serve the eternal. That is the Vedic injunction. 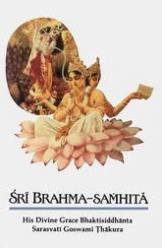 Without becoming Brahman, one cannot approach the Supreme Brahman. Just like without being fire, nobody can enter into the fire. Without being water, nobody can enter into the water. Similarly, without being fully spiritualized, nobody can enter into the spiritual kingdom. So nitaiyer carana satya. If you catch nitaiyer, the lotus feet of Nityananda, then you become immediately spiritualized. Just like if you touch electricity, immediately you become electrified. That is natural. Similarly, Nityananda is eternal happiness, if you touch Nityananda some way or other, then you become also eternally happy. Tanhara sevaka nitya. Therefore one who has in contact with Nityananda, they have become eternal.